This episode is hard for me to handle. I knew it was coming (the manga translations have picked up again, and seem to be on a frantic drive to try to stay just barely ahead of the anime), but still seeing it play out is painful. All the more so in that the way I review means watching the episode through multiple times. The impact isn’t any less for having seen it before. In some ways part of the unhappy feeling I get here can be put down to tonal dissonance (invoked deliberately on the creators’ parts). 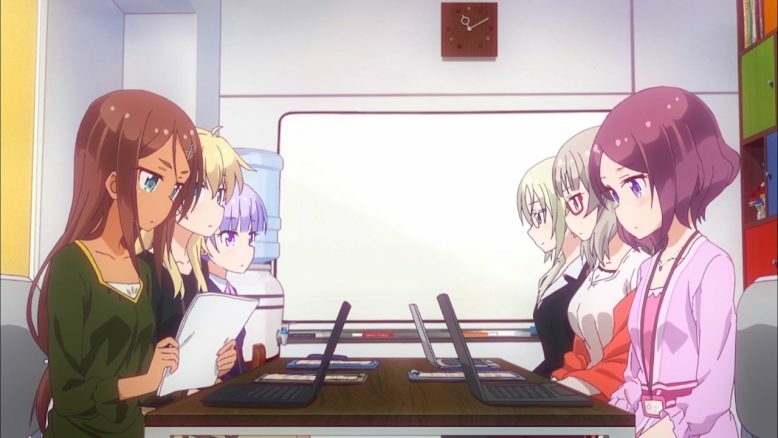 The first portion of the episode is fairly upbeat, with Nene finishing up her game and presenting it to Hotaru and Aoba. I can empathize strongly with Nenecchi here: as a creative person, sharing something you’ve made is simultaneously really exciting and really nerve-wracking. You go through the whole process Nene went through: “I can’t wait to show them! But what if they think it isn’t good? I know, I can say (insert excuse here) to explain why it isn’t as good as it could be!” and so on. 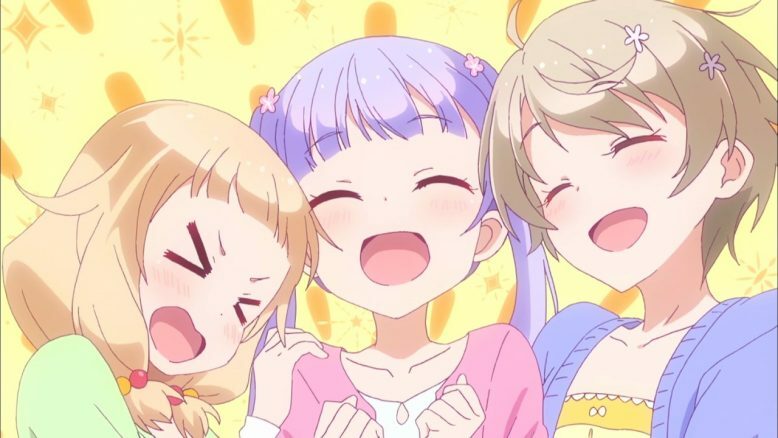 The delight Nene felt when Aoba and Hotaru were clearly drawn in, fully immersed and captivated by the game and its challenges, shows that she has gotten the reward she sought from this project. Real gamers played her game and found it fun to play. She created something worthwhile, and shared that worth with her friends. It’s just wonderful to see that. Unfortunately, Nene’s moment of triumph only makes the rest of the episode hit us that much harder. The publisher’s decision to make Ko draw the key visual for Peko instead of Aoba seems to hit out of nowhere. A cruel choice, whatever one might say about marketing realities. The whole concept of Peko has been built around Aoba’s designs. With tweaks and advice from Ko, certainly, but it isn’t Ko’s art and it isn’t Ko’s style. It is Aoba’s imagination that has shaped this world and given it life. It should be her right to show that world to everyone else. But the publisher wants a Name on its marketing. Ko has been in this business for 8 years, and she is famous. Justifiably so: she is good in a way that Aoba cannot match yet. Ko has fans of her own, who will be drawn to any project that bears her name. The publisher wants to take advantage of that. But that, I think, could turn around and bite them badly. Leaving aside that this is a very cruel thing to do to Aoba, and the fact that this will certainly affect morale at Eagle Jump since our assorted girls are going to see this hurting Aoba and thus be hurt by it themselves; the biggest concern I have is that this will actually backfire on the publisher completely. A fan community’s expectations are a very volatile and dangerous thing. They must be managed with extreme caution. Under no circumstances should you give them reason to expect something, and then not deliver it. Yet, the publisher is setting up their marketing for Peco to be “Newest collaboration by Hazuki Shizuku and Yagami Ko: the team that brought you Fairies Story!” and fans are going to expect something from that. Ko’s fans will come, expecting another game made using her designs, and they aren’t going to find one. And if my experiences with the video game industry tell me anything, it’s that that moment is likely to turn very ugly. 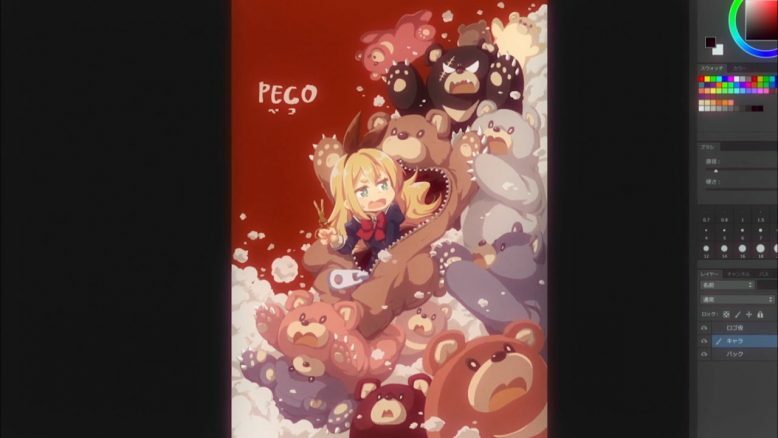 It won’t matter how good Peco actually is. What will matter is that what they were led to expect is not what they’ll end up getting. Some games have basically been killed for similarly minor-seeming things in the past, as the whole fanbase rises up in arms and storms to the internet to proclaim far and wide how the new game is utter trash that no one should buy. Aoba and Ko’s contest is particularly painful this time. Hazuki spells it out right from the beginning: Aoba cannot win this competition. She could create the most amazing illustration they have ever seen and it would not matter. No one in that meeting has the authority to change the decision that has been handed down. 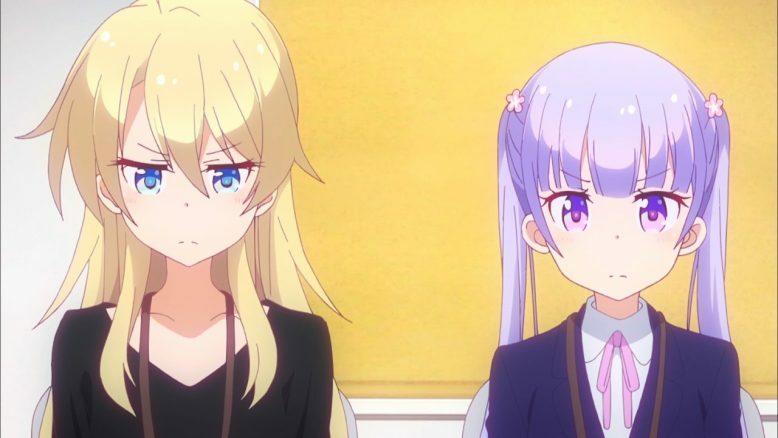 Ko has been chosen for her reputation, and nothing Aoba can do will change that. But Aoba cannot simply leave it at that and be happy with it. It will eat away at her. So, for her own sense of satisfaction, she has asked for this competition: for the two of them to create the best key visuals they can manage, and see who between them really is best suited for it. Still, with these stressful thoughts filling her head, she is in exactly the wrong frame of mind to create the sort of art she needs. It is hard to watch her struggle. Ko certainly feels the same way. 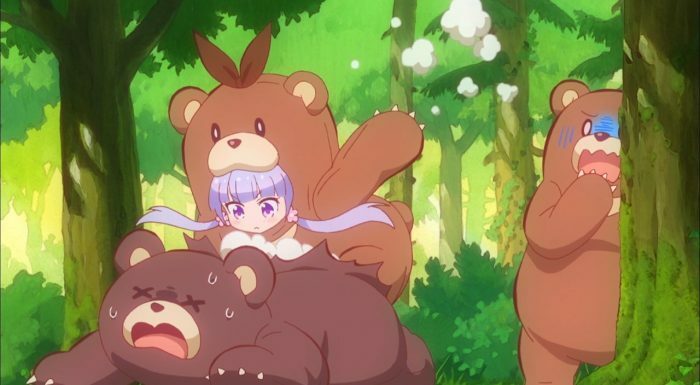 Finding herself being used against Aoba like this is hurting her as well, and she lets slip that maybe if she hadn’t helped Aoba with her character designs back during the first competition, maybe none of this would have happened. 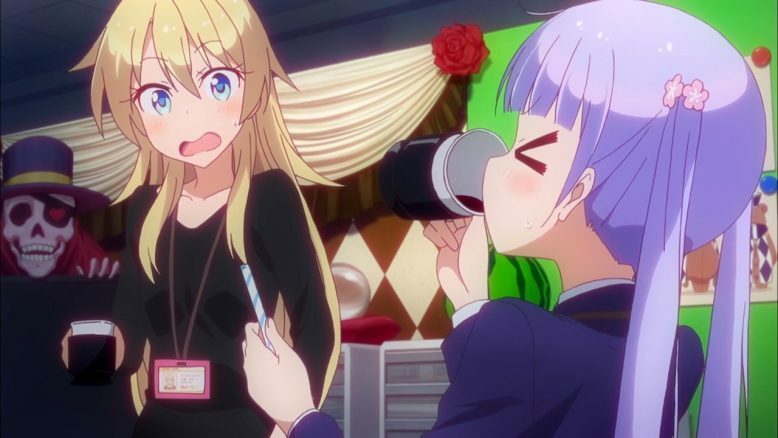 Aoba’s reaction, to drink the full cup of black coffee Ko brought her as a joke and say that she can handle a couple of bitter experiences, is… powerful. In some ways she’s the strongest out of all of us. Yes, she’s having to suffer through some things that hurt her right now, but that doesn’t mean she would undo the choices she made that led her to this point. The final night and it’s down to just Aoba and Ko in the office. Aoba is still finishing her illustration, while Ko has just finished hers. Unable to resist, Aoba asks to see Ko’s, and Ko admits to being nervous when bringing it up, something that’s never happened before. I think Aoba has become more of a peer in Ko’s eyes these days. 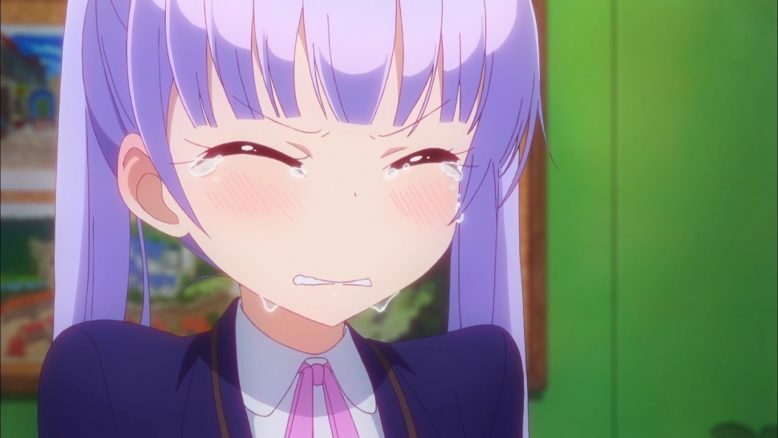 Still, Aoba cannot help but be overwhelmed when she sees Ko’s key visual, and she finds herself crying. Tears of frustration, pain, sadness, envy… probably too many emotions to name all mixed together. What matters is that she’s forced to admit that her very best effort, which is indeed the best piece of art she has ever created, is, in her eyes, not a match for the key visual Ko has drawn. And that hurts. Yet she pulls herself together very quickly, refusing to stay there and be comforted, pushing herself to go back and finish what she’s started. I will admit that I really like both illustrations. I don’t think I could choose one that is objectively “better” than the other. 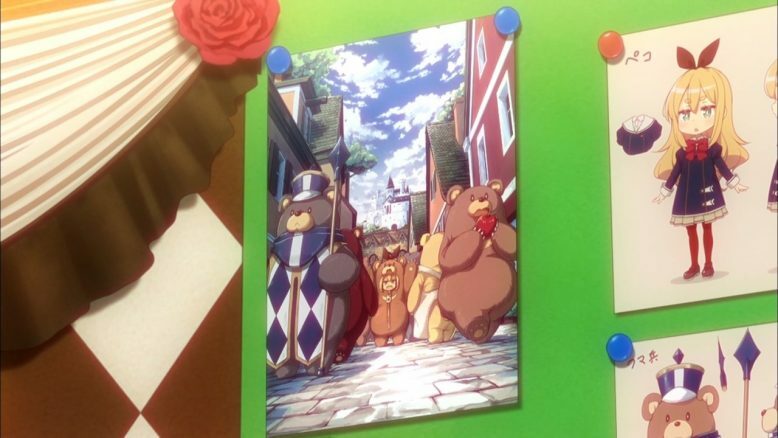 The fandom seems to be pretty well split as well, with plenty of debate going back and forth, with strong arguments for either image as being superior for a key visual. There is no question that both of them are excellent pieces of promo art. Aoba’s piece absolutely should be used; if not now, then definitely at some point. It’s too good to just let languish. 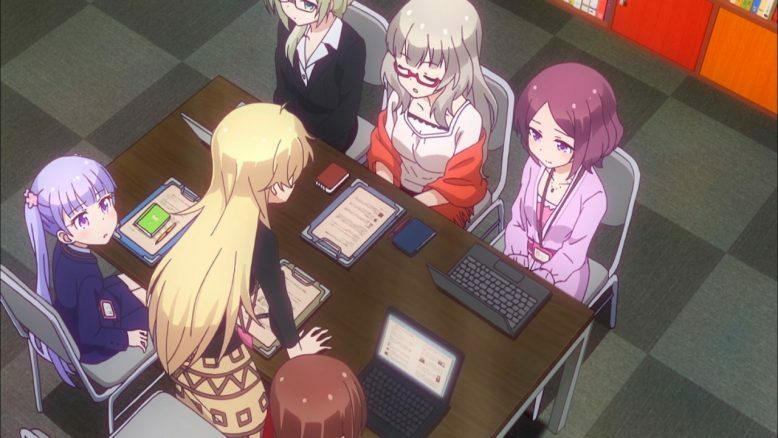 This is unquestionably the most emotionally-charged episode of New Game from either season. There is some really strong stuff here, and also, for the first time, there is a situation that doesn’t really end with a genuine “happy” ending. Yes everyone is basically satisfied with the outcome by the end of the episode, but the publisher is still screwing Aoba over and there’s nothing anyone can do about it. This is one of those cases where the harsh realities of life bleed over into our cute women making cute games cutely series and remind us that things don’t always work out perfectly. Hopefully we won’t have to face this kind of roller-coaster of emotions again in the future. Or at least not as intense.